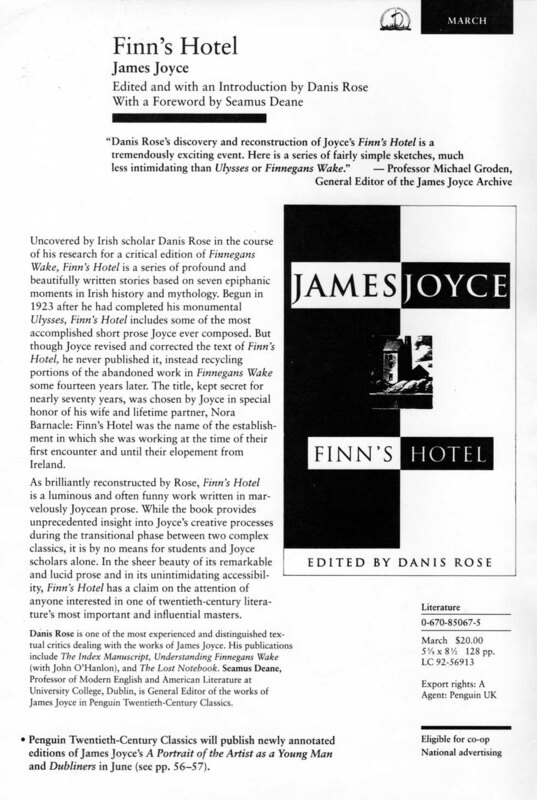 In 1992, when Danis Rose, its textual editor, first offered-up for publication Finn’s Hotel in the context of his four-fold critical edition of Finnegans Wake, he had secured the permission of the James Joyce Estate acting through the agency of The Society of Authors. Penguin Books quickly negotiated its purchase. When the imminent publication of Finn’s Hotel was announced by Penguin/Viking, it created a minor sensation. The publishing world greeted Finn’s Hotel and Penguin’s announcement of its publication with intense enthusiasm, and offers mounted for editions in other territories and in translations. It was, to quote the then Editor at Penguin, ‘the busiest day in the history of Penguin Books’ foreign rights department’. 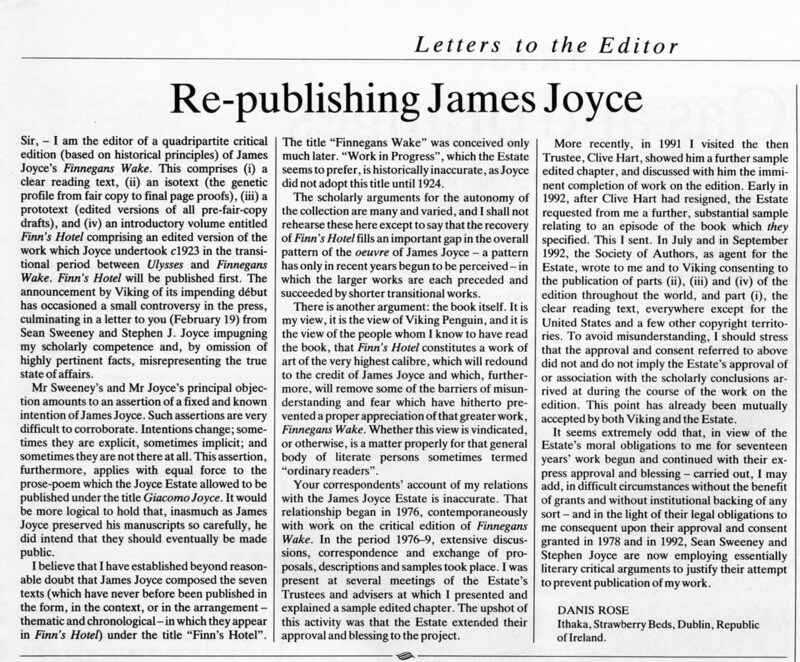 Unfortunately, learning of the great public interest and potential success of the edition — a title which it previously considered of little or no value — the Estate of James Joyce, through its lawyers, and bypassing its agent, the Society of Authors, purported to resile from its licensing agreement with Rose though no legal motion was ever filed in court. Nonetheless, fearing the loss of their other Joyce titles which were about to go back into renewed copyright (due to the imminent passage of the 1993 EU Directive), Penguin regretfully withdrew, alternate publishers receded, and thus Rose was left with no option but to put Finn’s Hotel on the back-burner. Twenty years later, with the expiration of copyright in Joyce’s works, the keystone Finn’s Hotel has now been brought out by Ithys Press and the Joyce oeuvre completed. Moreover, this newly edited and arranged edition benefits from the inclusion of heretofore wholly unknown manuscripts—those purchased by the National Library of Ireland in 2006—that comprise both alternate versions of the previously known elements of Finn’s Hotel and entirely new, unsuspected short texts, which further bolster Rose’s original argument for Finn’s Hotel being a distinct (if abandoned) work in itself, one that provides (like the posthumously published Stephen Hero and Giacomo Joyce) a far clearer picture of Joyce’s tremendous creative breadth and depth. 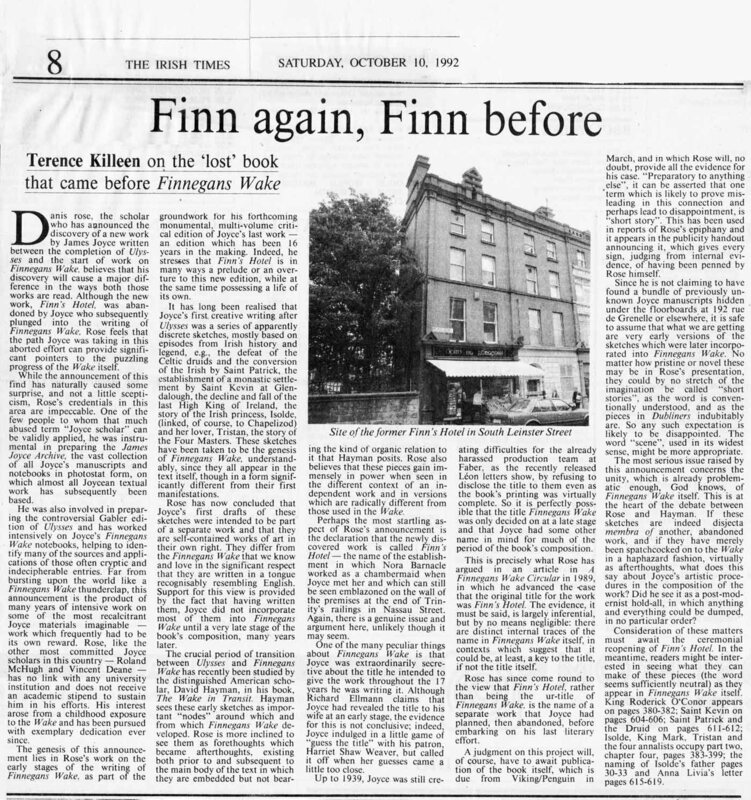 More on the history of Finn’s Hotel and the long road to its publication is addressed in Danis Rose’s Preface to the Ithys Press edition, excerpts of which are available here. The original Viking/Penguin 1993 catalogue announcement for their planned—but ultimately abandoned—publication of FINN’S HOTEL. The Irish Times, 10 October 1992. Times Literary Supplement, Letters, 5 March 1993.